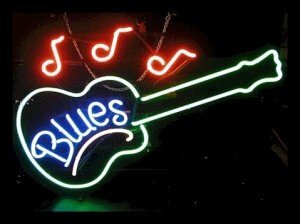 Blues bass guitar lesson first learn a little about where it came from. The bass guitar (also known as electric bass, or bass) is a stringed instrument played primarily with the fingers or thumb, by plucking, slapping, popping, strumming, tapping, thumping, or picking with a plectrum, often known as a pick. The bass guitar is similar in appearance and construction to an electric guitar, but with a longer neck and scale length, and four to six strings or courses. The four-string bass, by far the most common, is usually tuned the same as the double bass, which corresponds to pitches one octave lower than the four lowest pitched strings of a guitar (E, A, D, and G). The bass guitar is a transposing instrument, as it is notated in bass clef an octave higher than it sounds. 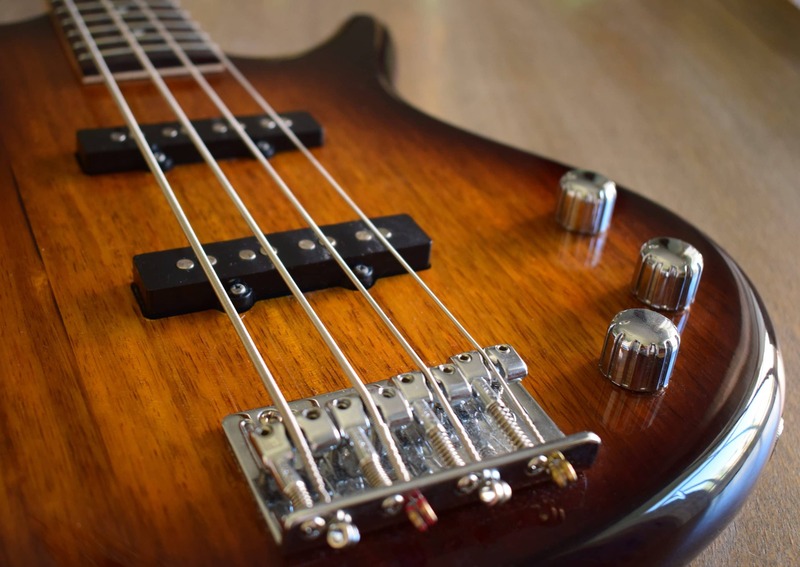 The electric bass guitar has pickups and needs to be connected to an amplifier and speaker, to make a sound loud enough to compete with other instruments. In the 1930s, musician and inventor Paul Tutmarc from Seattle, Washington, who was manufacturing lap steel guitars, developed the first electric string bass in its modern form, a fretted instrument designed to be played horizontally. The 1935 sales catalog for Tutmarc’s electronic musical instrument company, Audiovox, featured his “Model 736 Bass Fiddle”, a four-stringed, solid-bodied, fretted electric bass instrument with a 30 1?2-inch (775-millimetre) scale length. The adoption of a guitar’s body shape made the instrument easier to hold and transport than any of the existing stringed bass instruments. The addition of frets enabled bassists to play in tune more easily than on fretless acoustic or electric upright basses. Around 100 of these instruments were made during this period. Around 1947, Tutmarc’s son, Bud, began marketing a similar bass under the Serenader brand name, prominently advertised in the nationally distributed L. D. Heater Music Company wholesale jobber catalogue of 1948. However, the Tutmarc family inventions did not achieve market success. In the 1950s, Leo Fender, with the help of his employee George Fullerton, developed the first mass-produced electric bass guitar. Fender was the founder of Fender Electric Instrument Manufacturing Company, which made popular brands of electric guitars, basses and amplifiers. Fender’s Fender Precision Bass, which began production in October 1951, became a widely copied industry standard for the instrument. The Precision Bass (or “P-bass”) evolved from a simple, un-contoured “slab” body design and a single coil pickup similar to that of a Telecaster, to a contoured body design with beveled edges for comfort and a split single coil pickup. The “Fender Bass” was a revolutionary new instrument for gigging musicians. In comparison with the large, heavy upright bass, which had been the main bass instrument in popular music, folk and country music from the early 1900s to the 1940s, the Fender bass could be easily transported to shows. The bass guitar was also less prone to unwanted feedback sounds when amplified, than acoustic bass instruments. In 1953 Monk Montgomery became the first bass player to tour with the Fender bass guitar, in Lionel Hampton’s postwar big band. Roy Johnson, and Shifty Henry with Louis Jordan & His Tympany Five, were other early Fender bass pioneers. Bill Black, playing with Elvis Presley, switched from upright bass to the Fender Precision Bass around 1957. The bass guitar was intended to appeal to guitarists as well as upright bass players, and many early pioneers of the instrument, such as Carol Kaye and Joe Osborn, were originally guitarists. Following Fender’s lead, in 1953, Gibson released the first short scale violin-shaped electric bass with extendable end pin, allowing it to be played upright or horizontally. Gibson renamed the Electric Bass in 1958 to the EB-1. Also in 1958 Gibson released the maple arched top EB-2 described in the Gibson catalogue as “A hollow-body electric bass that features a Bass/Baritone pushbutton for two different tonal characteristics”. In 1959 these were followed by the more conventional-looking EB-0 Bass. The EB-0 was very similar to a Gibson SG in appearance (although the earliest examples have a slab-sided body shape closer to that of the double-cutaway Les Paul Special). Whereas Fender basses had pickups mounted in positions in between the base of the neck and the top of the bridge, many of Gibson’s early basses featured one humbucking pickup mounted directly against the neck pocket. The EB-3, introduced in 1961, also had a “mini-humbucker” at the bridge position. Gibson basses also tended to be smaller, sleeker instruments; Gibson did not produce a 34-inch (864 mm) scale bass until 1963 with the release of the Thunderbird, which was also the first Gibson bass to use dual-humbucking pickups in a more traditional position, about halfway between the neck and bridge. A number of other companies also began manufacturing bass guitars during the 1950s: Kay in 1952, Hofner and Danelectro in 1956, Rickenbacker in 1957 and Burns/Supersound in 1958. 1956 saw the appearance at the German trade fair “Musikmesse Frankfurt” of the distinctive Höfner 500/1 violin bass made using violin construction techniques by Walter Höfner, a second generation violin luthier. The instrument is often known as the “Beatle Bass”, due to its endorsement and use by Beatles bassist Paul McCartney. In 1957 Rickenbacker introduced the model 4000 bass, the first bass to feature a neck-through-body design in which the neck is part of the body wood. The Fender and Gibson versions used bolt-on and glued-on necks. With the explosion of the popularity of rock music in the 1960s, many more manufacturers began making electric basses, including the Japanese manufacturers Yamaha, Teisco and Guyatone. First introduced in 1960, the Fender Jazz Bass was known as the Deluxe Bass and was meant to accompany the Jazzmaster guitar. The Jazz Bass (often referred to as a “J-bass”) featured two single-coil pickups, one close to the bridge and one in the Precision bass’ split coil pickup position. The earliest production basses had a ‘stacked’ volume and tone control for each pickup. This was soon changed to the familiar configuration of a volume control for each pickup, and a single, passive tone control. The Jazz Bass’ neck was narrower at the nut than the Precision bass — 1 1?2 inches (38 mm) versus 1 3?4 inches (44 mm) — allowing for easier access to the lower strings and an overall spacing and feel closer to that of an electric guitar, allowing trained guitarists to transition to the bass guitar more easily. Another visual difference that set the Jazz Bass apart from the Precision is its “offset-waist” body. Pickup shapes on electric basses are often referred to as “P” or “J” pickups in reference to the visual and electrical differences between the Precision Bass and Jazz Bass pickups. Fender also began production of the Mustang Bass; a 30-inch (762 mm) scale length instrument used by bassists such as Tina Weymouth of Talking Heads and Bill Wyman of The Rolling Stones (“P” and “J” basses have a scale length of 34 inches (864 mm), a design echoed on most current production electric basses of all makes). In the 1950s and 1960s, the instrument was often called the “Fender bass”, due to Fender’s early dominance in the market. The Fender VI, a baritone guitar, was tuned one octave lower than standard guitar tuning. It was released in 1961, and was favored by Jack Bruce of Cream. Gibson introduced the short-scale 30 1?2-inch (775 mm) EB-3 in 1961, also used by Jack Bruce. In 1971, Alembic established the template for what became known as “boutique” or “high-end” electric bass guitars. These expensive, custom-tailored instruments, as used by Phil Lesh, Jack Casady, and Stanley Clarke, featured unique designs, premium hand-finished wood bodies, and innovative construction techniques such as multi-laminate neck-through-body construction and graphite necks. Alembic also pioneered the use of onboard electronics for pre-amplification and equalization. Active electronics increase the output of the instrument, and allow more options for controlling tonal flexibility. Giving the player the ability to amplify as well as attenuate (turn down) certain frequency ranges while improving the overall frequency response (more low-register and high-register sounds). 1973 saw the UK company Wal begin production of a their own range of active basses, and In 1974 Music Man Instruments, founded by Tom Walker, Forrest White and Leo Fender, introduced the StingRay, the first widely produced bass with active (powered) electronics built into the instrument. Basses with active electronics can include a preamplifier and knobs for boosting and cutting the low and high frequencies. Specific bass brands/models became identified with particular styles of music, such as the Rickenbacker 4001 series, which became identified with progressive rock bassists like Chris Squire of Yes, and Geddy Lee of Rush, while the StingRay was used by funk/disco players such Louis Johnson of the funk band The Brothers Johnson and Bernard Edwards of Chic. The 4001 stereo bass was introduced in the late 1960s; it can be heard on from the Beatles “I Am The Walrus”. In the mid-1970s, Alembic and other boutique bass manufacturers, such as Tobias, produced four-string and five-string basses with a low “B” string. In 1975, bassist Anthony Jackson commissioned luthier Carl Thompson to build a six-string bass tuned (low to high) B0, E1, A1, D2, G2, C3. In comparison with a standard four-string bass, Jackson’s six-string adds a low B string and a high C string. These 5 and 6-string “extended-range basses” would become popular with session bassists as they reduced the need for re-tuning to alternate detuned configurations like “drop D”, and also allowed the bassist to play more notes from the same position on the fretboard with fewer shifts up and down the fingerboard, a crucial benefit for a session player sightreading basslines at a recording session. In the 1980s, bass designers continued to explore new approaches. Ned Steinberger introduced a headless bass in 1979 and continued his innovations in the 1980s, using graphite and other new materials and (in 1984) introducing the TransTrem tremolo bar. In 1982, Hans-Peter Wilfer founded Warwick, to make a European bass, as the market at the time was dominated by Asian and American basses. Their first bass was the Streamer Bass, which is similar to the Spector NS. In 1987, the Guild Guitar Corporation launched the fretless Ashbory bass, which used silicone rubber strings and a piezoelectric pickup to achieve a “upright bass” sound with a short 18-inch (457 mm) scale length. In the late 1980s, MTV’s “Unplugged” show, which featured bands performing with acoustic instruments, helped to popularize hollow-bodied acoustic bass guitars amplified with piezoelectric pickups built into the bridge of the instrument. During the 1990s, as five-string basses became more widely available and more affordable, an increasing number of bassists in genres ranging from metal to gospel began using five-string instruments for added lower range—a low “B” string. As well, onboard battery-powered electronics such as preamplifiers and equalizer circuits, which were previously only available on expensive “boutique” instruments, became increasingly available on mid-priced basses. From 2000 to the 2010s, some bass manufacturers included digital modelling circuits inside the instrument on more costly instruments to recreate tones and sounds from many models of basses (e.g., Line 6’s Variax bass). A modelling bass can digitally emulate the tone and sound of many famous basses, ranging from a vintage Fender Precision to a Rickenbacker. However, as with the electric guitar, traditional “passive” bass designs, which include only pickups, tone and volume knobs (without a preamp or other electronics) remained popular. Reissued versions of vintage instruments such as the Fender Precision Bass and Fender Jazz Bass remained popular amongst new instrument buyers up to the 2010s. In 2011, a 60th Anniversary P-bass was introduced by Fender, along with the re-introduction of the short-scale Fender Jaguar Bass. Bass bodies are typically made of wood, although other materials such as graphite (for example, some of the Steinberger designs) and other lightweight composite materials have also been used. While a wide variety of woods are suitable for use in the body, neck, and fretboard of the bass guitar, the most common types of wood used are similar to those used for electric guitars; alder, ash or mahogany for the body, maple for the neck, and rosewood or ebony for the fretboard. While these traditional standards are most common, for tonal or aesthetic reasons luthiers more commonly experiment with different tonewoods on basses than with electric guitars (though this is changing), and rarer woods like walnut and figured maple, as well as exotic woods like bubinga, wenge, koa, and purpleheart, are often used as accent woods in the neck or on the face of mid- to high-priced production basses and on custom-made and boutique instruments. Other design options include finishes, such as lacquer, wax and oil; flat and carved designs; luthier-produced custom-designed instruments; headless basses, which have tuning machines in the bridge of the instrument (e.g., Steinberger and Hohner designs) and several artificial materials such as luthite. The use of artificial materials (e.g., BassLab) allows for unique production techniques such as die-casting, to produce complex body shapes. While most basses have solid bodies, they can also include hollow chambers to increase the resonance or reduce the weight of the instrument. Some basses are built with entirely hollow bodies, which change the tone and resonance of the instrument. Acoustic bass guitars have a hollow wooden body constructed similarly to an acoustic guitar, and are typically equipped with piezoelectric or magnetic pickups and amplified. Instruments handmade by highly skilled luthiers are becoming increasingly available in the 2010s. Exotic materials in high-end instruments include woods such as bubinga, wenge, ovangkol, ebony, and goncalo alves. Some makers use graphite composite to make lightweight necks More expensive basses often feature exotic woods. For example, Alembic uses cocobolo as a body or top layer material because of its attractive grain. Warwick bass guitars are well known for exotic hardwoods, making most necks out of ovangkol, and fingerboards from wenge or ebony. Some makers use solid bubinga bodies for their tonal and aesthetic qualities. A common feature of more expensive basses is “neck-through” construction. Instead of milling the body from a single piece of wood (or “bookmatched” halves) and then attaching the neck into a pocket (so-called “bolt-on” design), neck-through basses are constructed first by assembling the neck, which may comprise one, three, five or more layers of wood in vertical stripes, which are longer than the length of the fretboard. To this elongated neck, the body is attached as two wings, which may also be made up of several layers. The entire bass is then milled and shaped. Neck-through construction advertisements claim this approach provides better sustain and a mellower tone than bolt-on neck construction. While neck-through construction is most common in handmade “boutique” basses, some models of mass-produced basses such as Ibanez’s BTB series also have neck-through construction. Bolt-on neck construction does not necessarily imply a cheaply made instrument; virtually all traditional Fender designs still use bolt-on necks, including its high-end instruments costing thousands of dollars, and many boutique luthiers such as Sadowsky build bolt-on basses as well as neck-through instruments. The number of frets installed on a bass guitar neck may vary. The original Fender basses had 20 frets, and most bass guitars have between 20 and 24 frets or fret positions. Instruments with between 24 and 36 frets (2 and 3 octaves) also exist. Instruments with more frets are used by bassists who play bass solos, as more frets gives them additional upper range notes. When a bass has a large number of frets, such as a 36 fret instrument, the bass may have a deeper “cutaway” to enable the performer to reach the higher pitches. Like electric guitars, fretted basses typically have markers on the fingerboard and on the side of the neck to assist the player in determining where notes and important harmonic points are. The markers indicate the 3rd, 5th, 7th, 9th fret and 12th fret (the 12th fret being the octave of the open string) and on the octave-up equivalents of the 3rd fret and as many additional positions as an instrument has frets for. Typically, one marker is on the 3rd, 5th, 7th and 9th fret positions and two markers on the 12th fret. The long scale necks on Leo Fender’s basses—with a scale length (distance between nut and bridge) of 34 inches (864 mm) — set the standard for electric basses, although 30-inch (762 mm) “short scale” instruments, such as the Höfner 500/1 “violin bass” played by Paul McCartney, and the Fender Mustang Bass are also common. Short scale instruments use the same E-A-D-G tuning as a regular long scale instrument. Short scale instruments are good choices for bassists with smaller hands, such as children or young teens who are just starting the instrument. While 35-inch (889 mm), 35 1?2-inch (902 mm), and 36-inch (914 mm) scale lengths were once only available in “boutique” instruments, in the 2000s (decade), many manufacturers began offering these “extra long” scale lengths. This extra long scale provides a higher string tension, which may yield a more defined, deep tone on the low “B” string of five- and six-stringed instruments (or detuned four-string basses). Another design consideration for the bass is whether to use frets on the fingerboard. On a fretted bass, the metal frets divide the fingerboard into semitone divisions (as on an electric guitar or acoustic guitar). Fretless basses have a distinct sound, because the absence of frets means that the string must be pressed down directly onto the wood of the fingerboard with the fingers, as with the double bass. The string buzzes against the wood and is somewhat muted because the sounding portion of the string is in direct contact with the flesh of the player’s finger. The fretless bass lets players use expressive approaches such as glissando (sliding up or down in pitch, with all of the pitches in between sounding), and vibrato (in which the player rocks a finger that is stopping a string to oscillate the pitch slightly). Fretless players can also play microtones, or temperaments other than equal temperament, such as just intonation. While fretless basses are often associated with jazz and jazz fusion, bassists from other genres have used fretless basses, such as Freebo (country), Rick Danko (rock/blues), Rod Clements (folk), Steve DiGiorgio (metal) and Colin Edwin (modern/progressive rock). Some bassists alternate between fretted and fretless basses in performances, according to the type of material or tunes they are performing, e.g., Pino Palladino or Tony Levin. The first fretless bass guitar was made by Bill Wyman in 1961 when he converted an inexpensive Japanese fretted bass by simply removing the frets and filling in the slots cut into the neck with wood putty. The first production fretless bass was the Ampeg AUB-1 introduced in 1966, and Fender introduced a fretless Precision Bass in 1970. Around 1970, Rick Danko from The Band began to use an Ampeg fretless, which he modified with Fender pickups—as heard on the 1971 Cahoots studio album and the Rock of Ages album recorded live in 1971. Danko said, “It’s a challenge to play fretless because you have to really use your ear.” In the early 1970s, fusion-jazz bassist Jaco Pastorius had the fingerboard of his de-fretted Fender Jazz Bass coated in epoxy resin, allowing him to use roundwound strings for a brighter sound. Some fretless basses have “fret line” markers inlaid in the fingerboard as a guide, while others only use guide marks on the side of the neck. Tapewound (double bass type) and flatwound strings are sometimes used with the fretless bass so the metal string windings do not wear down the fingerboard. Tapewound and flatwound strings have a distinctive tone and sound. Some fretless basses have epoxy-coated fingerboards, or fingerboards made of an epoxy composite like micarta, to increase the fingerboard’s durability, enhance sustain, and give a brighter tone.